I’m in no doubt that I lived on the best street in Istanbul. And as a vast sprawling city spanning two continents, and with an estimated population of 14 million, I don’t make that statement lightly. On the European side, and not far from the ferry terminals, Çukurcuma is fashionable and bohemian. The area is made up of meandering streets, antique shops, cafes, street cats and a fantastic relaxed restaurant 49 Çukurcuma. I almost don’t want to tell you about this restaurant, but, I am in a generous mood, and the owner is a delight, so here goes. 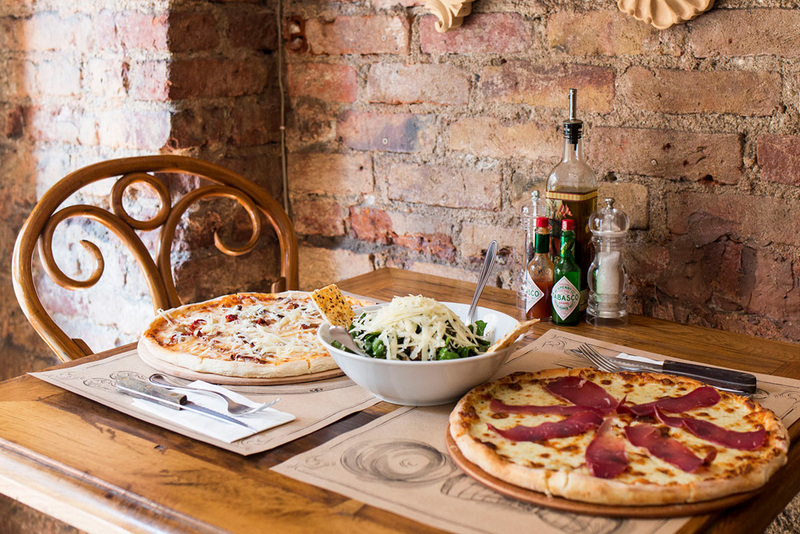 If you want the best pizza in Istanbul, head to 49 Çukurcuma. 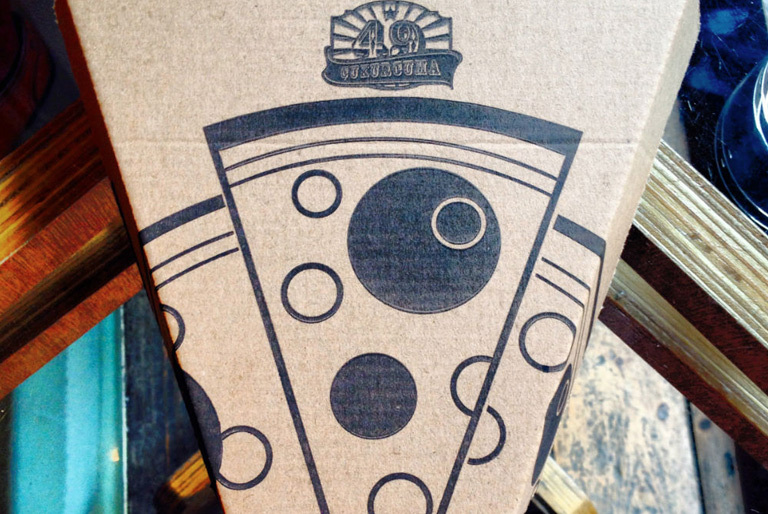 Scrap that, if you want the best pizza in… well… anywhere. Tall, Dark and Handsome loves pizza. When we were living in the UK he’d often make our pizza dough and we would decorate the flattened bases with our own toppings. We’ve eaten a lot of pizza. A recent 24-hour trip to Rome offered up a truly disappointing pizza and we were pleased to return to Istanbul for a proper offering! Çukurcuma 49 has real style. A split-level, former workshop the interior is brick, glass and wood. Heavy velvet curtains hang floor to ceiling and are opulent. It has the sort of natural style that makes you want to look around the room before you start to talk to your dining companion. In the centre of the ground floor is set a wrought iron lift that takes the staff down to the wine cellar – which can be viewed through a section of glass flooring. The huge on-street window is the perfect daytime coffee spot for watching life go by and reading a book, or sketching. It’s not a big restaurant and it’s not unusual to find it packed out. There is no pretention, just good food and a cozy atmosphere. On the weekends they move one table aside and set up live music. The menu is simple. You choose from pizza or salad; from beer or Desperate House wine. The wine is the restaurant’s own and is bottled on the small Aegean island of Bozcaada. Purchasing furniture is optional. 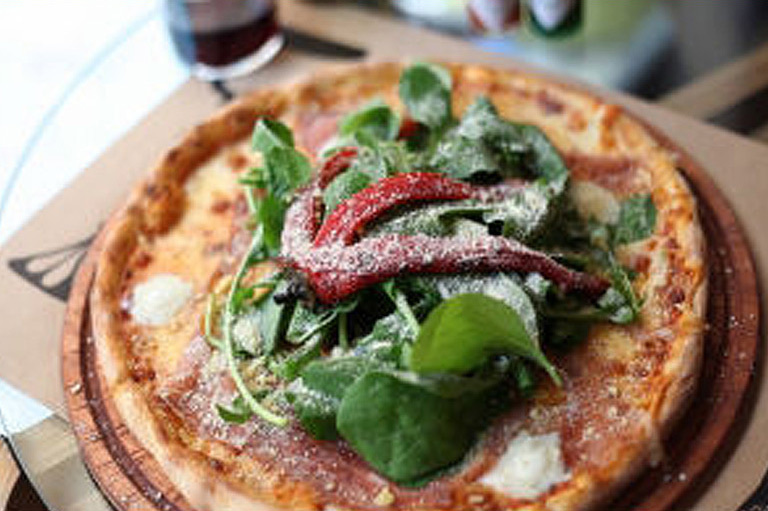 The 49 brick oven pizzas are superb, the chef uses fresh local ingredients to create thin-crust Italian-style pizzas. We return again and again and are thrilled that we can call it our local. 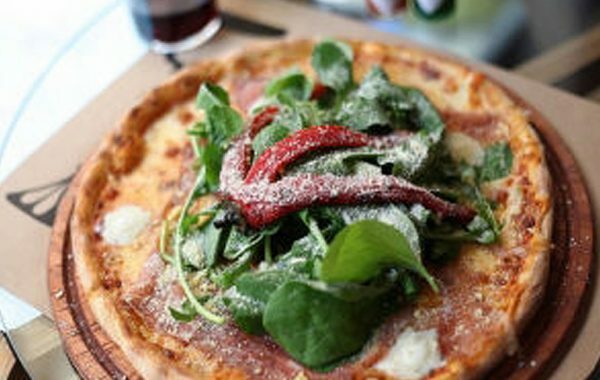 TDH has a pepperoni with extra tomato sauce and I opt for a Da NoHo with ham and rocket and a split long red pepper. Chilli oil, green Tabasco and homemade lemonade stuffed with fresh mint make for the perfect meal. My favourite salad has a rocket base with a Palma ham style meat, figs, walnuts and Turkish cheese. We don’t even need to order now – our choices are known and pre-empted. There is a fantastic breakfast pizza with bacon and egg and a Nutella calzone for desert – what’s not to like! The staff are a delight and always friendly and greet us with joy. It certainly wasn’t a difficult decision to eat here on New Year’s Eve. The cozy, intimate atmosphere is the perfect opportunity to eat pepperoni and ham when many places in the city don’t serve it. Take-away boxes are available and we have been known to order three pizzas and take the small remainder of the third home for breakfast.